Those of us who remember Vardis from days gone by will recall that they were fun – exciting, blistering, but above all fun. Nothing that they recorded ever changed the world, and although Steve Zodiac and his chums never contributed anything to world peace, the fall of the Berlin Wall or the search for the Loch Ness monster a trip to see the band was a guaranteed great night out. That some of their studio material never really captured the essence of the band is true, but on stage they were dynamite. 34 years after I first saw them, in February 2014, I was privileged to watch the band soundcheck in preparation for their reformation gig at Brofest in Newcastle. They took it very seriously indeed and worked hard to ensure that their first gig in three or so decades went off without a hitch. And you know what? On the night they were great. And better than that, they were still fun. They played the songs flawlessly, but they all had smiles as wide as the Tyne. 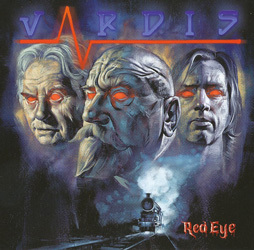 ‘Red Eye’ marks the band’s first album of new material since ‘Vigilante’ appeared in 1986, and, as with that Brofest show, guitarist/singer Zodiac and bandmates Terry Horbury (bass) and Joe Clancy (drums) have put a vast amount of effort into ensuring that it’s a worthy addition to the Vardis catalogue. Last year’s ‘200 MPH’ EP gave fans a slice of what to expect, and ‘Red Eye’ carries on in a similar vein, with both ‘Jolly Roger’ and ‘The Knowledge’ making the transition from EP to LP. The band have in the main slowed down a bit – but then, haven’t we all? – but when they do cut loose, as in the rough ‘n’ tumble of ‘Back To School’ or the aforementioned ‘The Knowledge’ the results are quite splendid. That’s not to denigrate the rest of the songs, which pick up a groove and run with it and are reminiscent of the likes of ‘Police Patrol’ from the early days, and the title track in particular makes for a solid, attention-grabbing opener. The playing is flawless, and Zodiac has certainly lost none of his dexterity over the years. Original single ‘100 M.P.H.’ puts in an appearance under its new guise of ‘200 M.P.H.’ and CD bonus cuts offer a romp through another golden oldie ‘Living Out Of Touch’ and an extended guitar instrumental under the guise of ‘200 M.P.H. (Reprise). ‘Red Eye’ is not only a worthy addition to any collection but also a worthy successor to all that’s come before. And it’s certainly a fitting tribute to Horbury who replaced Alan Selway back in 1983 and who passed away last year, never having the opportunity to see the album in the shops. Oh yes, and did I mention that it’s fun, too?